Many software/web-app developers naively assume that demand for their product is roughly static year-round, despite the fact that this is true for very, very few industries. Retail (in-a-box) software lives and dies by its Christmas numbers. B2B software often sees spiky behavior around the accounting periods and business cycles of its target sector. If you take a look at the data, it is likely that your business also has hot and cold periods — so how do you exploit that? For example, I sell software which makes bingo cards for elementary schoolteachers. Since a huge number of my customers use bingo as a fun diversionary activity rather than a regular instructional tool (nothing wrong with either approach, incidentally), I get big spikes of interest around holidays. Due to peculiarities of how American schools and religion relate to each other, the ideal holiday for my purposes is one where a) class is in session for b) a non-religious holiday which c) does not have an obvious history-focused lesson plan. If you take a quick look at the school calendar for those three criteria, you might find yourself saying Halloween. And if you do, congratulations: the spike in traffic I get in October every year as a result of interest in Halloween routinely makes October my best month of the year. The keyword profile for new customers coming in as a result of seasonal interest is generally very, very different from your everyday customer. SEOing for these transient customers requires doing a bit of work, and (especially for those of us who do not have the budgets of Amazon) significantly altering the front page of the site to fit a Halloween theme (with the appropriate keywords everywhere) might be a bit too radical. Enter the mini-site: you can take a handful of pages or, if you’re feeling generous, an entire new domain name, and then use an on-target visual design with optimized keywords to make it very, very obvious that you’re attentive to the desires of your holiday searchers. As competition for the holiday keywords is likely fairly low relative to the “head of the long tail” keywords in your niche, you can rank a mini-site fairly easily. Incidentally: That WordPress design is based on a free template from WP Design, who graciously gave me permission to use it commercially (it comes with a Creative Commons non-commercial license by default, and I only realized that when writing this blog post, and promptly offered to pay for their blessing, because if software developers can’t respect license terms then we are doooooomed). It is beautiful and saved me a lot of time in designing the site, and I’ll probably be going back to them for design projects in the future. Mini-sites require a fair bit of work and creativity to do right, but if you can’t do anything else, you can quickly create PPC campaigns for the seasonal keywords. Many businesses would use a holiday as a wonderful excuse to do a periodic sale — that is wonderful for you if it works. However, with just a little work you can respin your existing content into an on-target landing page and then toss up some AdWords at it. I ran a report on what URLs were showing my ads on the Content Network, and eyeballed them for the ones which were specific to Halloween. I banned those URLs from showing ads in my default ad group. I created a new ad group for Halloween-themed ads, and put the ads into it as Managed Placements, plus added in some Halloween related keywordery. This whole process took less than 15 minutes, mostly as a result of futzing around in the AdWords interface, as the landing page was already pre-written. When I spent some time reworking my default landing page a few months ago, I linked it to the I-can’t-believe-its-not-a-CMS that drives most of the content on my website. 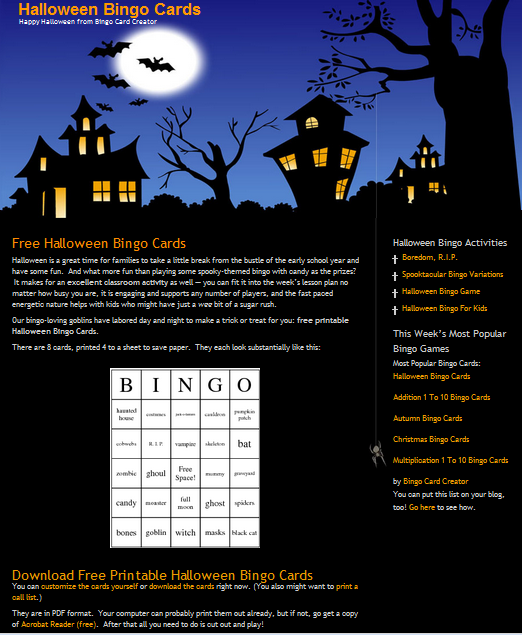 This lets me re-use any of my pre-existing content (bingo card word lists which I pay my freelancer to write for me) as a landing page just by changing the URL for it — for example, if instead of http://www.bingocards.com/lpc/halloween I were to write http://www.bingocards.com/lpc/christmas it would suddenly be a Christmas-oriented landing page. I strongly recommend that you have some way to quickly generate landing pages like this — if not a custom-built CMS lurking in the background, at least consider having a pre-made template which can be customized and uploaded in a few minutes. This lets you throw up a quick seasonal campaign anytime you get the inkling to — I don’t know if Dropbox does better on Boxing Day but if you can launch campaigns this quickly there is no reason why they can’t find out in the time it takes to brew coffee. I want to expand on that last idea a little bit, because it is so powerful for software developers: any IP you create can be replicated essentially indefinitely for no marginal cost, much like your main product. However, customers don’t see the world that way — they live in a world where scarcity is a reality, and accordingly perceive value in things they don’t have but might want. Thus, you can trade your customers access to IP in return for going further towards a conversion with you, and scale this offer across all your customers. The economics of this are staggeringly efficient compared to e.g. PPC advertising, and you’re giving the offer to folks who are already pre-disposed to liking you, so the conversion rates should be much higher than similar techniques aimed at “cold” prospects. Both making the offer and fulfilling it can be automated, so it costs a static amount of labor no matter how many customers you have and how many take you up on the offer. If you’re smart and make this process repeatable, it actually takes less time every time you do a similar promotion, since you’ll have the infrastructure already and all you have to do is create or buy the premium. Well, there you have it — three simple techniques you can adapt to almost any holiday or seasonal promotion. I hope they got the juices flowing a bit. If you’ve got any fun ideas in the same vein feel free to leave a comment — I love brainstorming with folks. Look for a post in early November on how these techniques actually ended up working for me. Early results look rather positive. For three years now I’ve been running a small software business in my spare time. It has been a very educational experience, especially in showing me that many things we think we know about software, programming, business, and the like are wrong. This is a bit of a shock, especially for well-worn chestnuts which have intuitive appeal, which we have come to invest with moral significance, and (most importantly, because we all think we’re smart) we’ve believe so self-evidently true as to make investigation a waste of time.